This past weekend, I purchased an older Clausing Colchester lathe at a local estate sale. Anyway, as of Sunday morning, the lathe still had not sold. So I decided to purchase. Yesterday, the estate sale company delivered it, and I am eagerly looking forward to trying to run it under power. Apparently, the previous owner had never used it in his home, because there was no 3-phase power there, just some unfinished electrical boxes. For inspection, I did have a chance to take off the top cover plate for the headstock, and the gears all looked fine, with the proper level of clean oil. I also pulled the motor vee belts by hand, and the spindle seemed to turn smoothly. 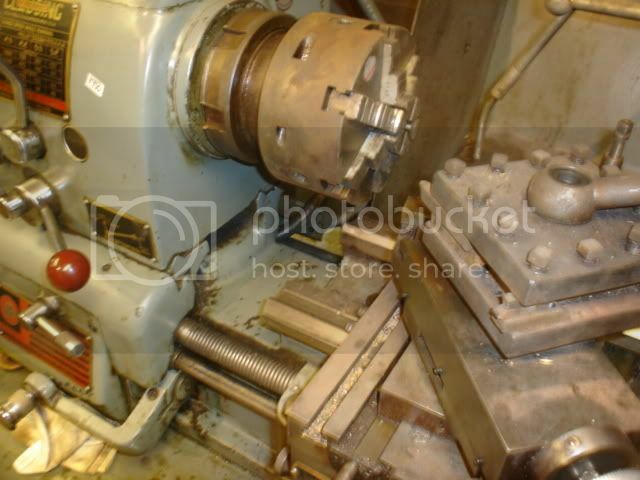 Does anybody else have any experience with this sort of lathe? How about any words of advice or warnings, for maintenance and operation? Watch out for hernias lifting that monster faceplate mate! I have a MK2 Student sitting here waitng for attention. Congratulations on your purchase, seem to remember the strapline 'the world turns on Colchester Lathes', but maybe that can be attributed to some other manufacturer. Not quite on topic but since you mention Tony Griffith's excellent (IMHO) site, I wonder how many of the forum members have visited it. Almost every (well some) ebay listings use a link to it to big up their item and it seems generally well regarded, certainly the best I have seen. I actually followed a link from a link from a link that brought me here! I e-mailed Tony a while ago asking which type of collets my BCA jig borer used web page and his reply was both informative and chatty. I also wonder if he has ever visted this site? I got mine last summer, haven't set it up yet. Mine doesn't have the T-slots on the carriage. I'm not even sure if mine has a two speed motor. It is a single voltage motor (440). I checked my motor books and there does not seem to be such thing as a dual voltage (220-440V) two speed motor. The little lever stacked on top of the larger lever in the lower right area of the headstock is the two speed motor switch. I don't know if the switch was installed even if the lathe was not equipped with the two speed motor. The only real problem I've noticed is that the headstock leaks oil at the lower gear shift lever. I'm not looking forward to trying to fix it, but I hate oil leaks. I'm particularly fond of the bed casting design. It looks like a bridge. Congratulations. You have a beautiful machine. Here's a pic of mine before I picked it up. Quote; "Tony Griffith's excellent (IMHO) site, I wonder how many of the forum members have visited it." No doubt you'll find a very small number who haven't visited Tonys excellent site. It stands as far and away the most often referenced source of diverse machine tool information. It serves the manual machining community as "the last word". Only in small, obscure pockets can additional information be found. Tonys site just keeps getting bigger and better, a treasure. Looks quite tidy. From the photographs it looks like a long bed version but I might be fooled by the oblique angle. It has a desirable and expensive 6 jaw griptru chuck aswell. I just got back from Jon's place. 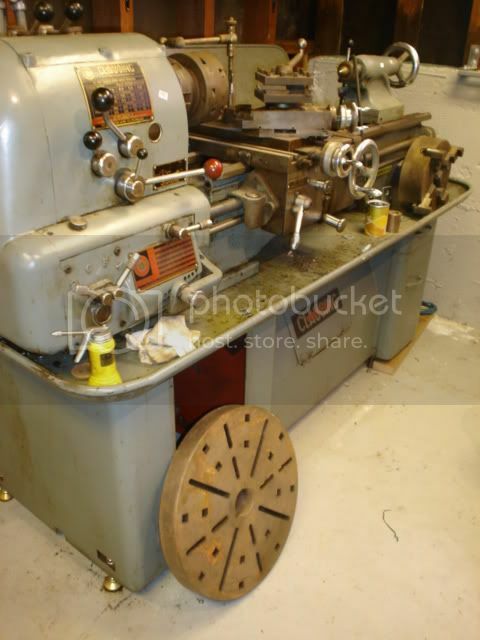 The new lathe looks to be in great condition and it is certainly a lot stouter than his Southbend. The gap bed version od\f these machines is especially interesting because of the slots on the top of the saddle. Also, note that the gap bed version has the hand wheel mounted on the right (the typical english position) an not on the left side (the typical American position). Well done Jon. I have one of these also and have found it to do the job nicely. The round head is a bit of a bugger though. You can't leave the chuck key there as it rolls off. did it come with the 5 position bedstop? very handy when boring deep holes. Thanks for the words of encouragement and advice. The link from Charles to the manual is particularly helpful, as I may need use of the schematic for wiring up power and troubleshooting. When I connected 3-phase 220VAC to the input wires, nothing happened. I am not familiar with motor starter circuits. Maybe it has an electrical problem that never was addressed, and prevented the lathe from getting used for the past few decades? I have not yet opened up the electrical boxes. For accessories, it has a 6-jaw chuck and 4-jaw chuck, both in very nice condition and made by Burnerd, as well as the 18-inch faceplate. It came with the square turret toolpost (made by Enco in the United States). It lacks the 5-position bedstop that Danny mentions, the steady and follower rests, and tailstock drill chuck. In the manual pages, there is a picture of a rear toolpost to put in the T-slots, for threading with the spindle rotating in reverse. That should be easy enough to make, when I have more time. Playing with the handwheel and cross slide, it feels as though my hands are crossed, compared to the American lathes I have used. 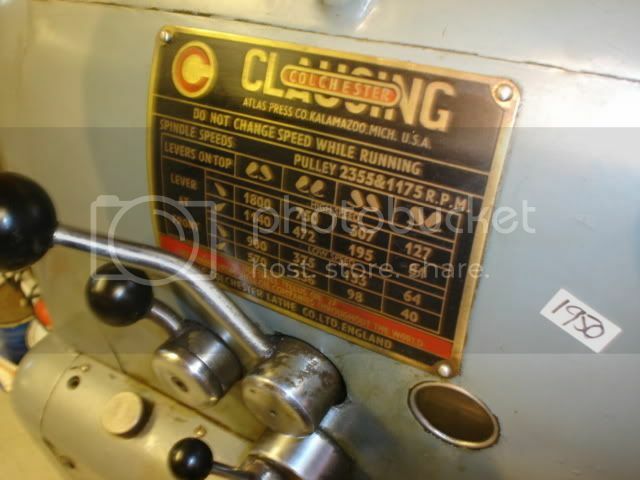 From the serial number, http://www.lathes.co.uk/colchester/page34.html, it appears that the lathe was made in the year 1967, which was when Colchester's production was at it highest level. They made about 5,000 lathes that year. I wonder how many of those machines still are around? I have visited tony in England,and have sent him a number of old manuals to help his valuable site get more complete. It costs a little money to get manuals,but he does an excellent job of reproducing and binding them. I have referred him to various threads on this forum when I come across something I think he might want to read. He is an invaluable source of information. Yours seems to be a Mk1.5 like mine which has the better gears and the safety apron but still has the round head. If I remember correctly there's an interlock wired to the top drawer in the right hand side of the base. Off hand, I don't remember if it needs to be open or closed for the machine to run. I didn't bother to hook that one back up when I wired in the VFD on my 12" Colchester Dominion. there is also an interlock switch on the guard over the gears and drive belts. I have some manuals for these lathes that I could copy for you if needed. Thanks again for your hints and suggestions. I was able to figure out the motor starting problem. From what I can tell, mine is a "Master" model, which differs slightly from the "Student." The machine I have does not have any electrical safety interlocks on the guard or drawer lock. I have a 1.5 HP Bridgeport mill, for which I had been using a static phase converter without a problem. When I first got the lathe, I tried plugged it into the statically converted 3-phase wiring, without success. Then I opened up the boxes to check voltages. It was evident that the static phase converter doesn't provide sufficient voltage between legs of the circuit. Thus, I hadn't provided proper input line power. So then I switched on the Bridgeport motor, thereby using that motor as an effective idler for a rotary phase converter. When the milling machine motor is on, its 3-phase motor is in parallel with the lathe input power. Now the lathe works! [img]smile.gif[/img] It is a "weak" rotary phase converter, as the Bridgeport has a 1.5 HP motor, while the lathe motor is 3 HP. For now, it seems sufficient to initiate the starter box for the lathe. I think that a longer term solution will be to install an idler motor in parallel with the 3-phase power lines, thus generating a cleaner 3-phase signal, which will allow the lathe starter circuit to work properly without needing the mill to be running. Great lathe! 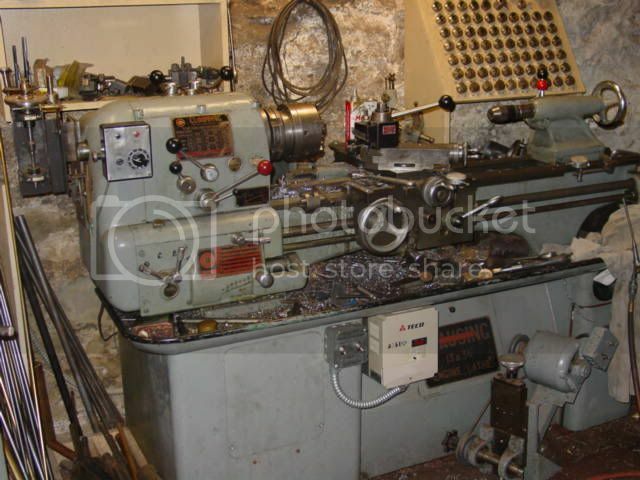 I have the MKII version (square head) of that same lathe. I have the same two-speed motor. You have to run a rotary hase converter with a two speed motor. The Motor switches poles to run the second speed and the static converter won't handle it. I ran into the same problem with my machine. Email me and I can provide you with some pictures or wiring diagrams. I have a similar lathe. Clausing colchester 13"x 36" no gap bed. Made by Atlas Press in the USA (1962). Your headstock also reads Atlas Press but your saddle looks like the English version. See pic below. The 2 speed motor and the large range of speed make phase conversion somewhat difficult. I've had the lathe over 20 years. Initially I set up an autotransformer static converter to run it (they won't run properly on a regular static converter). I had to set up a relay to sense whether it was starting in Hi or Lo and adjust the starting caps accordingly. It will start a collet at 40rpm or a 10" 4 jaw at 1800rpm with no problems. Eventually I added a VFD (lathe can run from VFD or Phase Converter) to slow spindle below 40 rpm for a relieving attachment I am building (one of my many unfinished projects).